One of the things I most like about chukar hunting is that it provides endless chances for me to set new standards of idiocy, to epitomize increasingly precise definitions of moron, and to share these achievements as perhaps some kind of penance or verbal self-flagellation in the hope that I might one day afford a ticket, third class as it most probably would be, on the Clue Train. Not that stats matter all that much, but they help illustrate what I’m talking about here. The last six times I’ve sought chukar to shoot I’ve hiked a total of 22.35 miles, ascended 5,715 feet, been in the field about 24 hours, driven about half a million miles, fired all of three shots, and hit one itsy-bitsy chukar chick, which I miraculously recovered in an all-out sprint against a determined Peat (let’s hear it for small victories). After a great opening weekend, this season has stunk for me and it’s mostly because I am an idiot. Here’s why. So I drove about 75 minutes in 80 degree aridity on powder-dust, washboard roads and set the mutts loose in some of the bleakest terrain I could find. It was so hot my lightweight, wicking upland pants began fusing with my epidermis. The sun was so high in the sky the only shade anywhere was under my pickup. Even north-facing slopes contained no escape from the sun, and the only few blades of green grass grew scantly at the bases of a few tall bunch grass tufts in a wee tight ravine, at the very bottom of which, unbeknownst to me because of the tall sage and bitterbrush hiding him, Angus pointed three of what were surely the most poorly hydrated chukar on the planet. I learned this only after hitting the shock button on his e-collar by mistake, which no doubt caused Angus to flinch and the birds to bust out of range. Idiot move. The day before, while on a drive when it was, yep, 80 degrees, I insisted on getting out of the truck with Angus and having Leslie pick us up “at the bottom.” This was Hell’s Canyon, which is pretty big if you haven’t been there; its “bottom” is bigger than Beyonce’s after a bon-bon binge. Anyway, I thought there had to be chukar down there, so I took off with Angus and Leslie drove off. I’d never been to this area, but could see the water way down below. More than two ankle-thrashing hours later, after finding no birds, we hit the road but had zero idea where Leslie was because one of our radios was dead (because, um, I’m an idiot). We walked for about a mile before she found us. She waited politely for Angus and me to get our sweat-soaked bodies situated before telling us that she saw hundreds of chukar along the road, all the way down to the bottom. I know what to do. I just don’t do it, and I really can’t explain why. That makes me an idiot. At least. This is one if your best! I love the bottom is bigger than Beyoncé on a bon bon binge! Down here in Utah we have a lot of birds but it is so blasted hot! Best of luck ! Let me guess. On opening weekend you said out loud something like, “This is the best opening weekend ever, Angus, I’ll bet this is going to be our best season yet!” The gods are always listening. I had some layovers in Boise this past week and went for a three hour walk on the greenway and was sweating plenty. Unseasonably warm for sure, but you guys have a long season. We’ve been in MT since mid-September and we’ve had plenty of days when it’s been warmer here than back home in NC. So we start hunting when the sun comes up, finish around noon when it get’s in the sixties, and head to the dog-friendly pub. Thanks, Andrew. It’s been a weird fall, for sure. Good luck – looks like the weather might be changing. Beautiful country. Birds are flighty everywhere. But mostly I’m really sorry you hurt your ankle. Ouch. Was it a break or a sprain? Hope it is feeling better before too long. Thanks, Peter. That was a video from my idiocy 4 years ago. My ankle’s fine, but I don’t know my assonance from a hole in the ground. I hunted chukar, Huns, and grouse in northeast Oregon for the past couple of weeks. The dry conditions seem to have driven the chukar into the brushy ravines and river bottoms. I found several coveys by working the brushy stuff but none in the traditional grass flats. 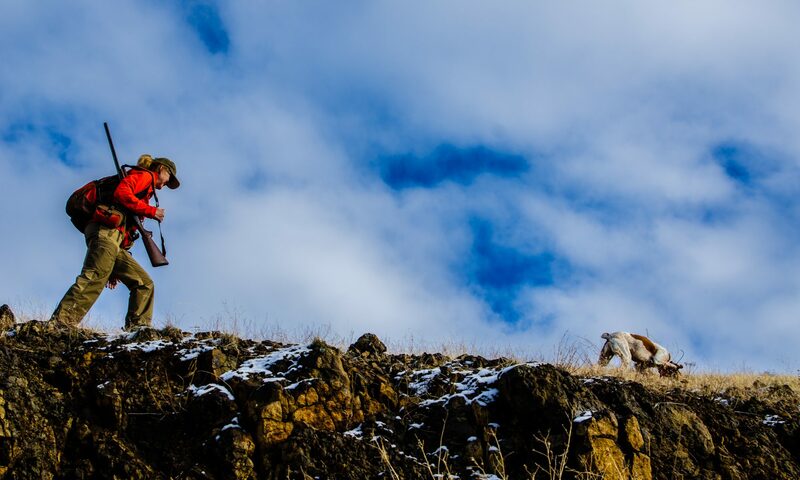 Of course fighting up steep gullies that are filled with thorns is even more work than the usual stair master routine that we call chukar hunting. Thanks, Pete. That makes sense, and a friend hunting deer last week near here told me they found tons of chukar in exactly the same types of places you mentioned. Now that we got some rain, I’m sure they’ll move somewhere else, but I’ve got my hope back. I appreciate your information. Bob – I thought you might like to see the ancient Egyptian tapestry pictured in this article. My son is living in Cairo, Egypt and sent me the link. Clearly chukars have long been worshiped. That is really something, Larry. I might have to blog about this. Thanks so much for sharing it! Thanks again for sharing your stories. It helps to feel better when I participate in the same kind of moronic behavior. Why do we do things things we know are wrong and then try to convince ourselves we had a good time anyway? That’s a really good question, Dale. I don’t know the answer to it, other than doing those kinds of wrong things is better than not doing them (at least at the time you decide to do them). Yesterday we drove to a new spot to try, and when we got there it was blowing 40 mph. Were we not going to try? No, we went out, but the poor dogs struggled (Angus did manage to find a covey to point), and it wasn’t very pleasant. But the scenery was spectacular and we felt alive from the buffeting. Hey Bob, been following your videos for some time now. I have a thought for you to try. Perhaps you have already. When you walk in a point, try holding the sling and forend in your left hand grasp. This will eliminate the pendulum effect of the sling,however slight. It may be a small thing but you may find it useful. It is mainly Huns and sharptails for me here in Montana, but I try to get in a few days on Chukar each year while my legs will still take it. Regards to you and Leslie. Looking forward to a new update is. I hope you have been having a great hunting season.